What a great way to get the Bank Holiday weekend off with a swing. Last night, I hosted a post-show Q&A at MISS NIGHTINGALE. This original British musical is now in its sixth iteration – musicals, as Sondheim says, aren’t written but re-written – since starting life as a short piece in Ipswich and at the King’s Head Theatre in 2011. Since then, it’s toured the UK extensively and has now transferred for an eight-week season in a full-scale production at The Vaults, the perfect underground venue, beneath the rumbling trains of Waterloo Station, for a show set in London during the Blitz. The musical – conceived, written (music, book and lyrics) and directed by Matthew Bugg, who is also one of six members of the tight-knit actor-musician ensemble (he plays no fewer than six instruments to boot: saxophone, clarinet, piano, ukulele, violin and accordion) – centres around the saucy cabaret singer of the title (played by cabaret star Tamar Broadbent in her theatrical debut) and two of the men in her life, her composer and her producer, who secretly fall in love with each other. It’s an original story, at turns deeply touching and hysterically bawdy – the authentically period sounding songs include comic delights about pussies and sausages (my absolute favourite). But it also makes serious points about female liberation, fascism and, in particular, gay prejudice. 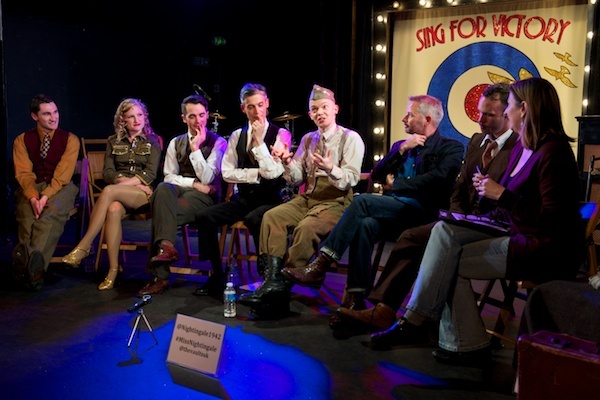 The musical reclaims the forgotten fate of gay men castigated as ‘the enemy within’ during World War Two. It would be another 25 years until homosexuality was partially decriminalised in England and Wales (50 years ago this year). How far have we come? How fragile are the rights we’ve gained? After the performance last night (13 April 2017), I was joined for the Q&A by Matthew Bugg, Tamar Broadbent and fellow cast members Conor O’Kane, Nicholas Coutu-Langmead (who play Polish-Jew immigrant George and upper-class Frank), Niall Kerrigan and Tobias Oliver, as well as creative consultant Joe Harmston. Q&A photos care of Peter Jones. Facebook Live via the company. 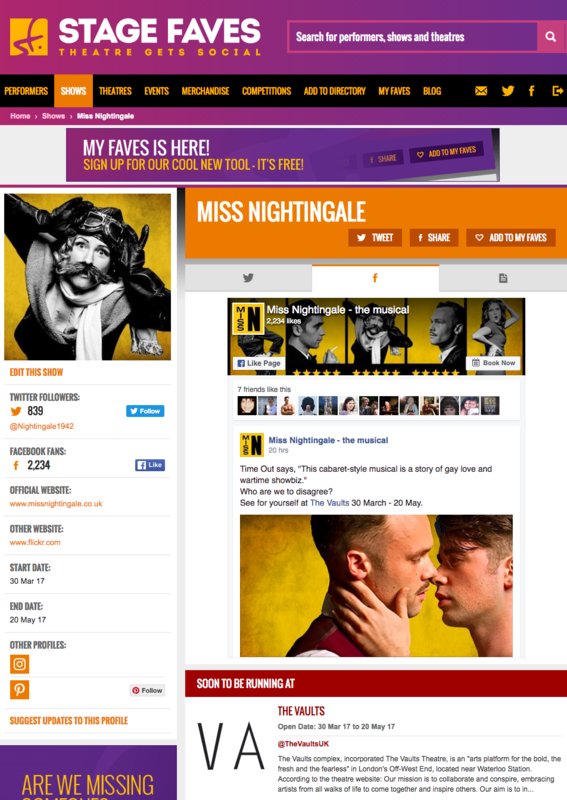 Miss Nightingale continues at The Vaults until 20 May 2016.